Great for playing on grass, sand or any flat, level playing surface, this 9-Piece Bocce Game Set is a relaxed yet strategic game with an ancient lineage. It most closely resembles bowling, requiring skill, accuracy and just a little luck. The object of the game is to roll your bocce balls closer to the pallino (jack) ball than your opponent. The game continues until 12 points have been scored or to pre-determined points set by the players. 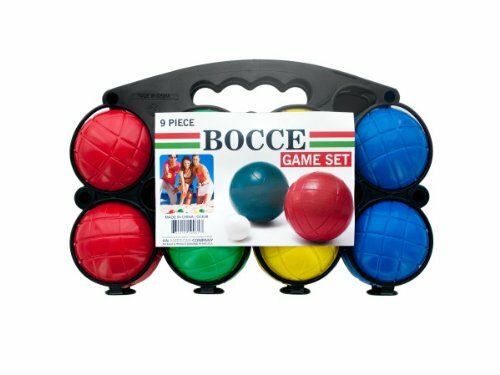 Set includes 8 bocce balls, 1 pallino ball and a handy carrying case, all made of sturdy plastic. For 2 to 8 players. Includes playing directions. Comes packaged in a poly bag.